So, I was out at my local FLGS this past week and saw that he had in a set of the new Terraclips 3D terrain - the set in stock was the Buildings of Malifaux, which is pretty expensive for a product which is interesting, but of unknown quality since you probably haven't seen a set out of the box unless you went to GenCon. So, since I didn't I was a bit hesitant to purchase a set. Another thing that put me off was the store didn't have any clips needed to use it. So, I informed the store owner and he promptly ordered a box of clips (in this case a box of mixed clips of 40 of each type, corner, flat and triple connector clips). Today, I opened the boxes and started playing around with the buildings and the clips. 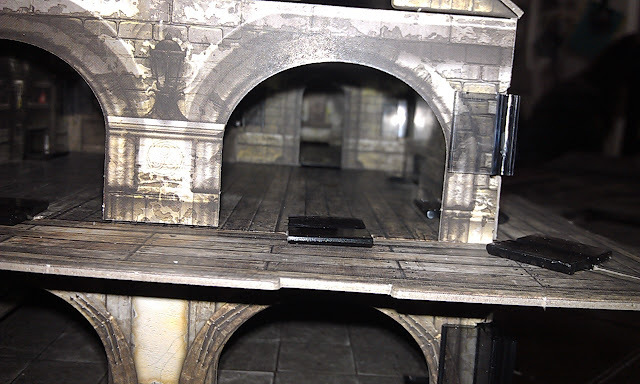 The buildings are made of stout card common to known games like GW's Space Hulk tiles - very heavy card stock. 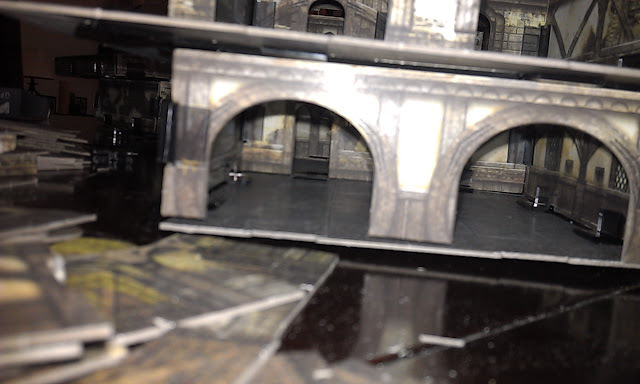 The buildings are very nicely cut from the sprue and you will need to de-sprue the card stock walls, etc., from the frames before you can play with the set. This takes about 20-30 minutes to get all of the pieces out and sort them into piles so you can take stock of what you have and prepare to assemble your first building. So, the card stock is sturdy, it isn't bullet proof and it can still be bent, folded, spindled or mutilated while taking it off the frames or sprues. So, a word of caution, take your time, remove the pieces carefully as some of the cuts may not have fully pierced the card to make removal perfect. I had a door piece where part of the door was not fully cut through and the door tore a bit and a small piece of the printed door was left on the sprue. Accidents happen though, but just a word of caution. (I had been careful, but in some cases if you don't support the whole mass of pieces, some parts will fall out as the cuts are that good, and in other cases, well, they stick!) After getting all of the parts removed, I began to play with the pieces and build some buildings to see what they looked like. 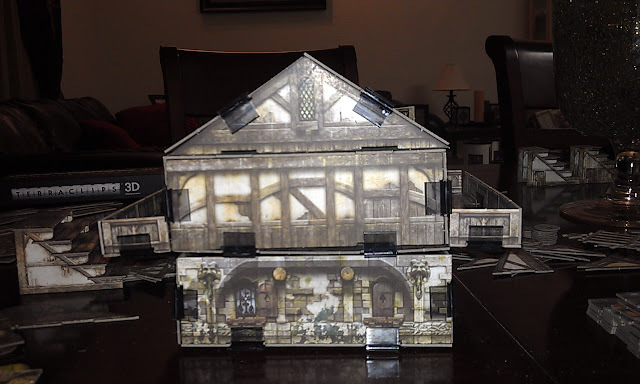 They are indeed some of the nicest card buildings you can purchase which are also modular. I have loads of PDF files for card buildings which you can assemble, but these are in a completely different class. First, a PDF file printed on card - even 120lb card stock is no where near the same thickness. This product is truely a heavy-weight card made from sturdy stock and equivalent to 5-10 sheets of regular card laminated into one piece in terms of thickness. So, the sturdy factor is that these will holdup to the rigors of gamers who are - shall we say - less than dextrous with handling figures, terrain, or dice. Second, the printing on these pieces is exceptional and of a depth that many color printers cannot match in terms of printing technology. So, expect that the card buildings you have will pale by comparison. Third, the buildings you create are - well - big, very big, or in some cases monstrously huge. 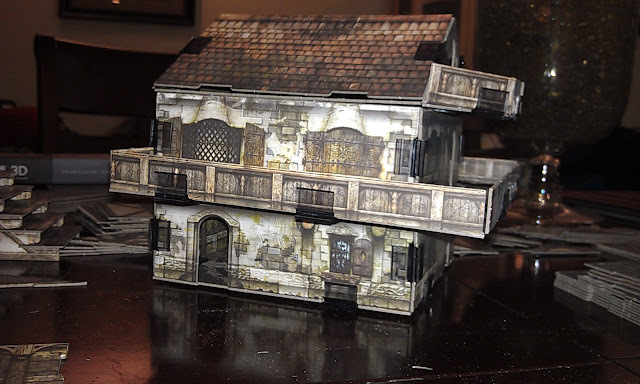 If you have seen a box of these buildings, you can get an idea as the tiles shown give you a vague scale, but they don't do the product justice. These buildings are designed for actual playing purposes where a figure occupies a square on the product - and they are well marked even though subtly done - in a nice grid pattern. This is as opposed to the typical PDF product which is similar, but limited by the size of the paper you can fit through your printer. Not to say some products don't make the cut, the Fat Dragon products are excellent, and would scale well with these products - albeit - these are truely modular as you can take them apart and reassemble them in a new configuration in a short period of time. So, what would you use this product for? 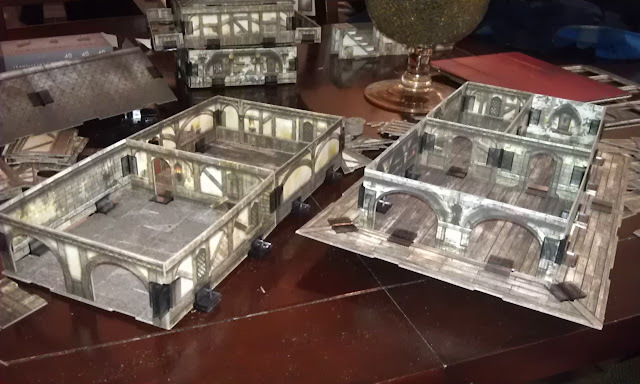 In looking at the pieces they will make great buildings for Mordheim style games, scenery for Lord of the Rings Strategy Battlegame, Malifaux obviously, as well as any other skirmish game which requires modular scenery where you can maneuver miniatures in a Medieval period looking set of buildings. The timber frame construction and stonework is typical of European buildings, and even some early American buildings. The tile roofs are found many places, and the buildings are such that you can use them for so many different skirmish games they will make a great addition to anyone's gaming table. They would even go well with World War II or Weird War II games, and even Zombie games if that is your thing. Here you can see a two-story building with an attic. The building is ~9 inches square on the inside with an outer deck set on the 2nd floor. The doorways are open as I have yet to assemble the doors. The doors have a door with a slot where you can glue a cross-piece to make them free standing so you can "open" the door without it falling into the building or onto the floor. The clips shown are the ones which I purchases, as you can see they are a translucent gray color. They don't really detract too much from the buildings when viewed, but if you are an asthetic purist, the Fat Dragon or other PDF style buildings from card will have a more polished look if you are good at papercraft. These look nice enough for our purposes - which is having removable layers and gaming pieces which can be flattened for travel. Another view of the side of the building. You can see that the deck on the third floor out of the attic is a bit sloped - I will have to toy with this and see if I can change it round. Like I said, I was just toying with the pieces and sticking stuff on as I went to see how it went together. This took about 15-20 minutes to assemble. So, be fore-warned, the product, while great, is not "instant city" as it will take some time to sort through parts, assemble them, and make sure you have enough of the right clips to put the building together. The back view of the building. They look nice. The details are very well done, and unlike some of the card buildings I've purchased over the years, there are NO SKULLS on these buildings! Nicely done! Here is another "quickly assembled building" which I threw together without care for which parts matched with each other, I just threw them together to see how big these things could get. This building is very big. about 72 square inches big if you are counting. It is 6 inches wide and 12 inches long give or take. I failed to grab some figures for comparison. I really should do this, but I'm tired and lazy right now as it has been a long day. Perhaps tomorrow I will amend this post with more photos with figures. Check back and see! Another view of the big building. The doorways here come with large double doors which should prove fun to have in some games. 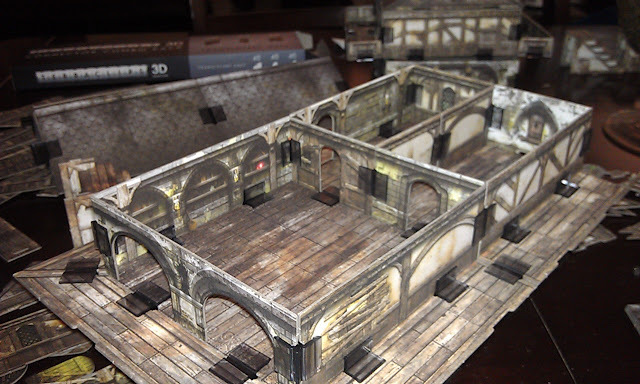 These buildings will make some interesting terrain for Mordheim, or other skirmish games with 25-32mm sized figures. A view inside the building through one of the doorways. The large double door gives you a good view down through to the inner doorways inside the building. A view inside the main floor showing the depth of the building and the possibilities for layouts. The large building with the roof removed. Here you can see the inner walls and the doorways into the various rooms. Yes, there is the possibility for assembling the buildings and putting together an "inn" with multiple chambers for guests to stay in, fight in, and die in. The details on the walls are very nice and while you can see some of the detail, the photos really do not do the product justice. Another view of the product exploded with the second floor removed. The roof is at far left, the main floor is center/left, and the second floor with the added on balcony without rails is on the right. I did not put the railing on the deck on this building for one reason. I ran out of clips. I only purchased the one box that the FLGS had in stock at the time. The store only had one box of the Terraclips terrain and one box of the clips. So, be prepared, here comes the "rant" portion of the product review. Wyrd Miniatures and World Works Games have put out a great product, but they have done so in a fashion which is a bit deceptive and I, for one, do not appreciate it. Let me describe how it is deceptive. First, in looking at the color photos of the product in magazines and on-line, they show you a box of the product, and then assembled buildings from the box. This is fine, but they are very deceptive in not putting out to you in bold print that you need to purchase the "Terraclips" which are sold separately. The "don't forget the clips" logo on the box is there, but the print is small, the clips are shown full life-sized on the box and the dang box is heavy enough that you are deceived into believing that there will be SOME of these clips in the box. Don't be. The box is nothing more than a box of card stock and it is virtually useless WITHOUT the Terraclips! Also, you need to know from the get-go that the Terraclips are also a bit pricey for a gaming supplement. 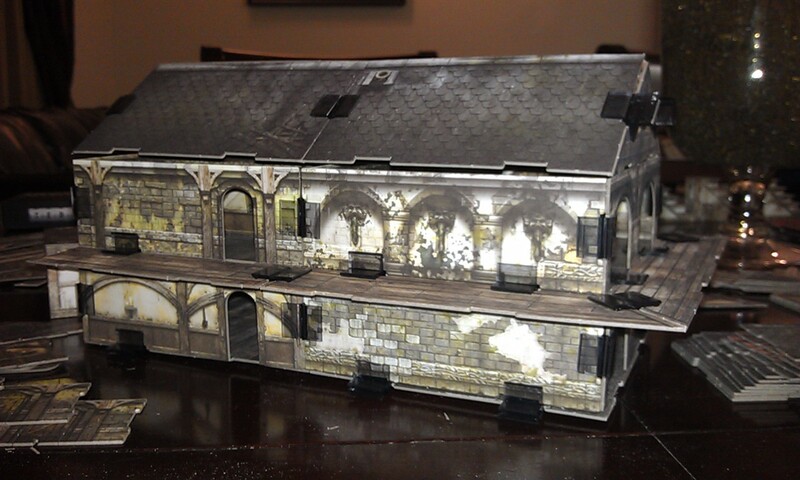 The box of "Buildings of Malifaux" was $49.00 at my local store. The price is a bit steep by most standards, but not completely out of line. The box of "Terraclips" that I purchased was $18 for 120 clips, 40 of each type. Now, here is the rant proper - the clips you need are loads and loads of corner clips - loads of them. You cannot skimp on them in the assembly process as the buildings will not be very sturdy without the connectors. One box of connectors will NOT allow you to assemble all of the building parts in one box of this product in my test-assembly. It will take at a minimum two boxes of mixed clips to get enough of the corner clips to make use of all of the wall sections and floors possible. My problem with this concept is that if you are going to sell a product, you had best give the consumer some idea of how many of the dang clips he will need to assemble it so they can budget for the complete purchase. Here, there is no information where you can see how many you will need or how many you have to have on hand to make use of the bulk of the product parts. Had I known you would need several boxes of clips, I would have made sure to have the store owner order more of these clips. You can't assemble anything if you don't have them. Flat clips give you no ability to build in 3D, you need the corner clips and the "T" clips to go vertical. So, if you are contemplating purchasing this product, look at your budget because you are going to spend a minimum of $49 per box and $18 per box of clips and you will need at least two boxes of clips to make use of all of the parts. 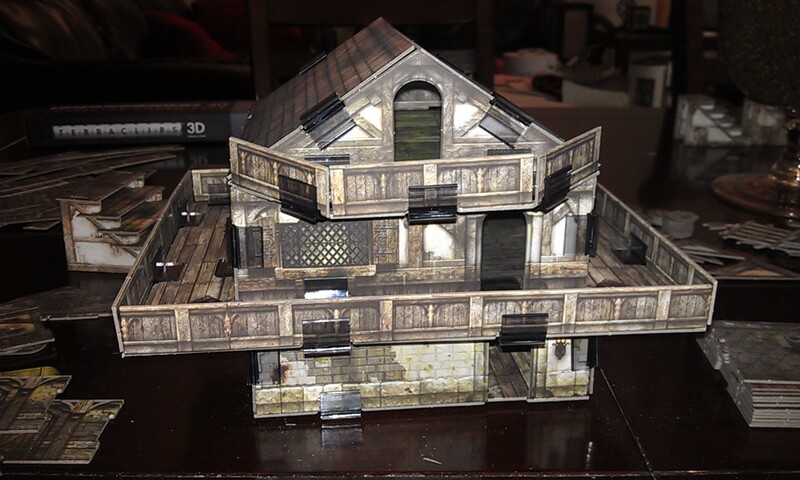 This comes to $87 per set to make half a dozen modular buildings that look very good on the tabletop. So, they are MORE expensive than the old GW paper-terrain city, more modular, sturdier, but still a decent value for a fold-flat system of modular terrain. I give the over-all product two grades - Product Quality A- (some care must be used in assembing the buildings to prevent clips peeling the surface and sprues are not always cleanly cut). Product Value = C+ (Expensive for a piece of modular terrain. By comparison, a GW plastic building of the same type will cost LESS than a set of these parts, but it only has ONE configuration). I hope you enjoyed this first product review! Nice review. Thank you. That was a very fair rewiew. I agree about the clips. 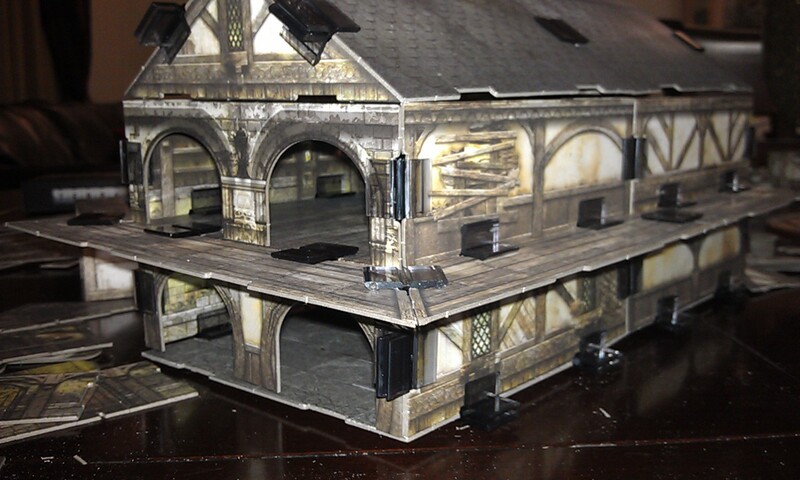 I almost bought the buildings of Malifaux set once, but the thought of paying another $20 for clips just turned me off. I didn't know you needed closer to $40 worth of clips. That's really bad. The set does look nice, though. I don't think the clips are too obtrusive, especially when for the benefits they confer. He, Thomas S. here. I wanted to say thanks for the review. These do look quite excellent. A question I had was about how many buildings of what size could you get from a set? Would it be enough for a city fight in 40k? A recreation of the battle of Osgiliath in LOTR? or maybe instead just a scene from Bree? I really like that these don't have skulls and such on them and am very interested to see how the other two sets look. Thanks a ton for the review and the pictures! @Vutall: the set gives you enought for half a dozen buildings if you've got enough clips. I don't at the moment, so I can't be sure. Remember, the buildings are very big. Three sets and you could do a large scale Osgiliath scene with huge buildings. I will update this with another review when I get more clips and the sewer set.